A man killed his baby son by shaking him in an "act of deliberate violence", a court has heard. Sam Gildea, 30, of Partington in Trafford, admitted the manslaughter of four-month-old Alfie Gildea. 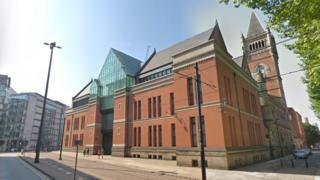 Manchester Minshull Street Crown Court heard the boy was found with head injuries by his mother on 12 September 2018, and died two days later. Gildea, who will be sentenced at a later date, also admitted a charge of controlling or coercive behaviour. The 30-year-old was due to stand trial for murder, but his guilty plea to an alternative charge of manslaughter was accepted by the Crown. The court was told sentencing would not happen before Friday as the issue of the potential danger Gildea may pose had to be assessed.